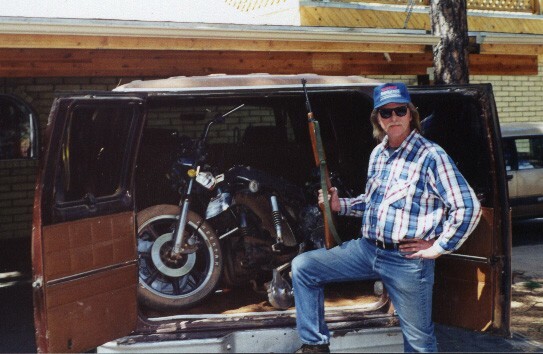 Welcome to Bruce Mangels’ The Virtual Junkyard for Motorcycles. I’m just a one man show, trying to eek out some extra coin by being down to earth, and real. I do my very best to make each transaction happy-time for both of us. Your Hopeless Junkie is in reality, me, mild-mannered Bruce Mangels. This site offers you a chance to wander thru my Virtual Junkyard yourself, without getting your fingers dirty, or “stuff” on your shoes. Please use my email link here to order parts or ask any questions. Postal (or any type MO) Money Order preferred, checks are held 2 weeks, thanks! Fans of the original DigiDog, he’s now retired, he was last seen on the beach, sucking a Corona and dogging a cute poodle. Toby, the wonder cat, has taken over guard duties, he’s got paws and claws like a Bengal tiger, so count your fingers before and after your visit, transfusions NOT available, sorry. Lest the guns and The Hunt “Schtick” bother you, the rifles were borrowed to illustrate how simple this page is, Illustrating how you have to “Hunt” for what you need, because I’m no web designer, as you can see. So, please cut me some slack, I’m not a “gun nut”, though I really enjoy the hobby, and I’m not trying to look all hard or anything. The Mighty White Hunter returns from another Successful Hunt! I Just Gotta Work on My Tan. Got me some complaints about the size of my weapon, strange though, none from the ladies. So, whipped out a decent sized one in case you need visual aids. Uses the “F” word, those not proficient in it’s use, or under 18, should NOT proceed down this trail. Click here for our Company Motto. Want to join? 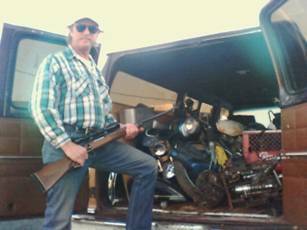 Send us pictures of you Happy Hunters getting into the Spirit(s) on The Honorary “Bubba” List; join In by send me a picture of you glowering over a nice motorcycle “kill”, and I’ll put you up on the web! VJMC members welcome, please ask about special deals. My mailing address is shown above. Sorry, cannot be liable for shipping loss or damage the Post Office may cause, please include extra for insurance if you want it. This page written and created by: little old me (you think I’d pay for this? ).